I haven’t been to Mitsu-Ken Okazu and Catering since they were located in their original School Street location. It was a miracle they had so much business in their original location with no parking! I decided to try their new location out last week because I had a hankering for some good ‘ole garlic chicken. Their new location has a lot of parking, much easier to maneuver especially early in the morning. It can be a bit confusing when you get in since there are a lot of folks standing around, head straight to the cashier if you are ready to order. The folks standing around are most likely waiting for their food. Great deal! I don’t really like bacon but wanted to get their breakfast so I got the deluxe! I shared the bacon with my coworker and enjoyed the breakfast. I like that you can order your eggs the way you want it, they are pretty quick too! This was ono. This is a great deal! And this bento has everything I want in a bento! 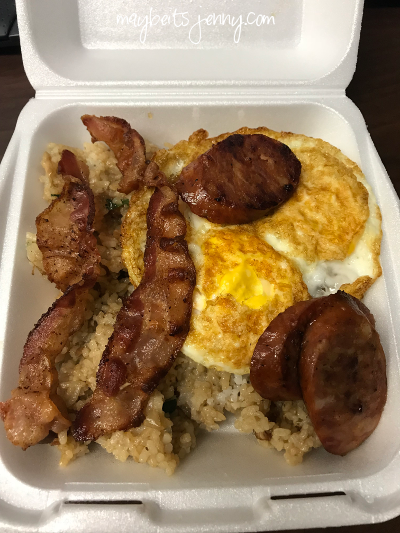 Great fried saimin, portuguese sausage (yes, I got it again!) and of course the garlic chicken! I didn’t get to heat it up for lunch but it still tasted good cold. I love that I can pick up breakfast and lunch before heading into work. Mitsu-ken, once a classic, always a classic! This entry was posted in Food, Restaurant and tagged Bento, Japanese Food, Okazuya. Ooh, garlic breath! 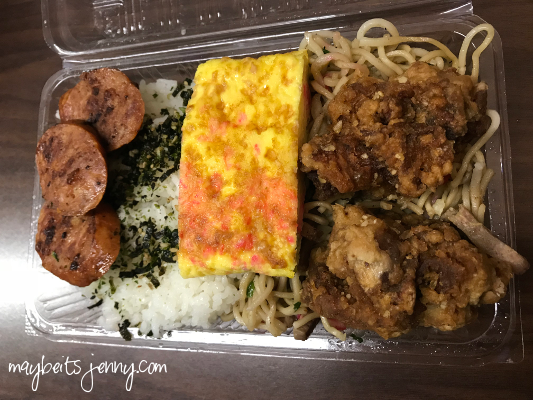 I’ve been craving a good local style bento for the longest time and fried noodles, too! Thanks for feeding me virtually with your wide range of posts, Jenny. I also just noticed June is going to be your five year blogging anniversary (at least on this WordPress version) so congratulations!